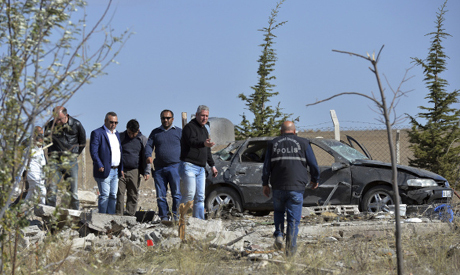 Two people suspected of planning a car bomb attack on the Turkish capital Ankara on Saturday blew themselves up after being confronted by police, averting what the justice minister called a "huge disaster". The suspects, who both died in the explosion, were believed to be preparing an attack when they set off the explosives, the official Anadolu news agency said. "A huge disaster has been prevented. It is probable they would have attacked Ankara.... All signs are pointing to the PKK terrorist organisation," Justice Minister Bekir Bozdag told the CNN-Turk broadcaster. The bombing comes two days before the first anniversary of Turkey's deadliest terror attack in its modern history in Ankara which left 103 dead. Ankara governor Ercan Topaca told reporters at the scene it was "highly likely" that the suspects had connections to the outlawed Kurdistan Workers' Party (PKK). "The materials used, the construction and the way it was planned point to the PKK...." he said, quoted by Anadolu. The PKK -- proscribed as a terrorist organisation by Turkey, the EU and US -- has been waging a 32-year insurgency against the state in the country's southeast. Bozdag added that Turkey was in a "critical position" in the region and referred to "sources of terror" in Syria and Iraq where conflict is raging. Video published by Dogan news agency showed the moment officers urged the suspects to surrender before a large and loud explosion sends clouds of smoke and rubble thrown into the air. Violence returned to the region after the collapse of a two-year ceasefire last year with hundreds of Turkish security forces killed and thousands of militants dead. In the latest clashes, eight PKK militants were "neutralised" in Cukurcu district in Hakkari province on the border with northern Iraq, the Turkish armed forces said, quoted by Anadolu. The governor said police swooped early on Saturday after a tip-off from Diyarbakir, a mainly Kurdish province in Turkey's southeast. No-one else was killed or injured in the blast understood to have taken place close to a black car in the town of Haymana, around 30 kilometres (18 miles) from Ankara, the governor's office said in a statement. The suspects were believed to have been hiding in a hut near a stud farm. "The security forces launched the operation and warned (them) to surrender. A short while later (and) before any intervention, two terrorists confirmed to be a man and a woman detonated themselves," the statement added. In televised comments, Topaca also said the suspects were a male born in the eastern province of Bingol and an unidentified female. She was later named in Turkish media. He added that the authorities were looking for a third person adding that the bombers had hung a Turkish flag on the car to avoid suspicion. An ID card was also found at the scene, the statement said. Forensic investigators wearing white overalls were inspecting the area of countryside where the burnt-out black car was found, an AFP photographer said. On Friday, the Kurdish group Kurdistan Freedom Falcons (TAK) with ties to the PKK claimed responsibility for a motorbike bombing on Thursday near a police station in Istanbul which wounded 10 people. President Recep Tayyip Erdogan was due to chair a security meeting in Istanbul from 1530 (1230 GMT), according to the presidency website, although further details on what would be discussed was not given.